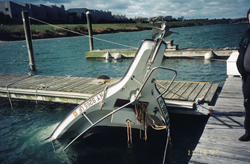 BoatUS takes a look at how boats sink and what boaters can do to prevent a sinking. Most boats sink at the dock, like this center console that went under due to a failed hose clamp. Interestingly, low-cut transoms that were common on boats in the 1990’s and a cause of sinkings is no longer much of a factor. When a boat sinks, that’s likely the end of her. That’s because repairs on a sunken boat often cost more than the actual value of the boat. So if boaters want to prevent a sinking at all costs, what can they do? Boat Owners Association of The United States (BoatUS) recently took its first significant look since 2006 at its boat insurance claims files to identify the causes of boat sinkings and found that most were preventable. About two out of every three (69%) boats sink at the dock or mooring, while the remainder (31%) sink while underway. Of all of the dock/mooring sinkings, 39% occur when some small part gives up the fight with water due to wear, tear and corrosion. When it comes to gradual leaks due to slowly failing parts, too many boats existed in a “zombie state” somewhere between floating and sinking, dependent upon the bilge pump, which merely postponed the sinking until the pump failed or was overwhelmed. This one is a no-brainer: lack of maintenance is the factor here. For boat sinkings while underway, the most common cause (43%) is hitting something – a log, the bottom or colliding with another boat or dock. Some of these sinkings might have been avoided if some some extra care had been taken – and some can be chalked up to simply bad luck. Interestingly, low-cut transoms that were common on boats in the 1990’s and a cause of sinkings is no longer much of a factor, as contained splash wells separating the interior of the boat from the transom are more common in boat designs today. However, being swamped while tied stern-to waves remains a cause. For inboard-outboard powered boats, inspect sterndrive bellows annually and replace every three to five years. The shift bellows is usually the first to fail. For inboard powered boats, check the stuffing box every time you visit the boat, and repack – rather than simply tighten down the nut – every spring. For engines with raw water hoses, replace them the moment they indicate wear – such as when small cracks appear or they feel “spongy” when squeezed. Rusty hose clamps are also a concern and should be replaced. Replace the engine cooling system impeller every two to three years. Inspect the boat’s cockpit and livewell plumbing – again look at hoses, clamps, and cracked or broken fittings. Make sure you can inspect all such plumbing, and if you can’t, install inspection ports to make the task easier. Each season take are hard look at all below-waterline fittings, hoses, and clamps. Don’t forget the drain plug – you knew this one would be on the list. Keep a good lookout and ask guests to help keep their eyes peeled for deadheads. If you’ve grounded or hit something, consider a short-haul to inspect the bottom or drive gear. Always pull trailerable boats from the water when storms are forecast. These boats generally have too little freeboard to stand up to any kind of wave action. Dock line management systems that keep the boat centered in its slip can prevent snags that sometimes lead to a sinking.